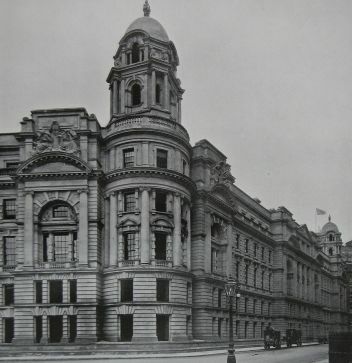 Whitehall in the 1930s, looking South. 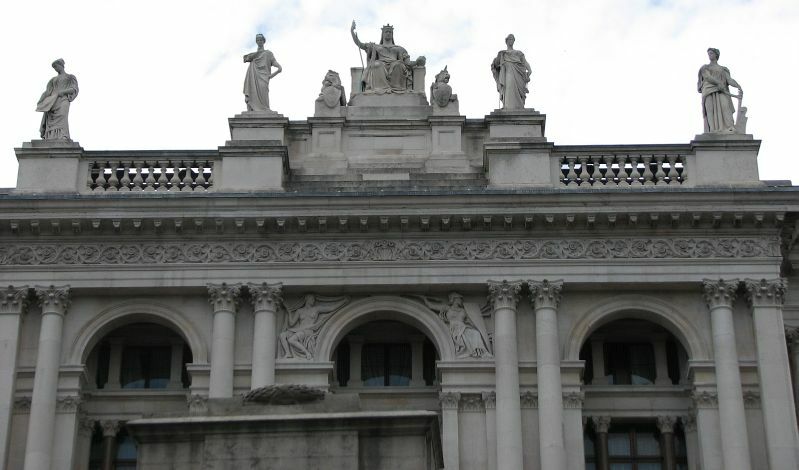 Whitehall, long the administrative centre of the nation, contains a fair crop of Victorian buildings and sculpture. 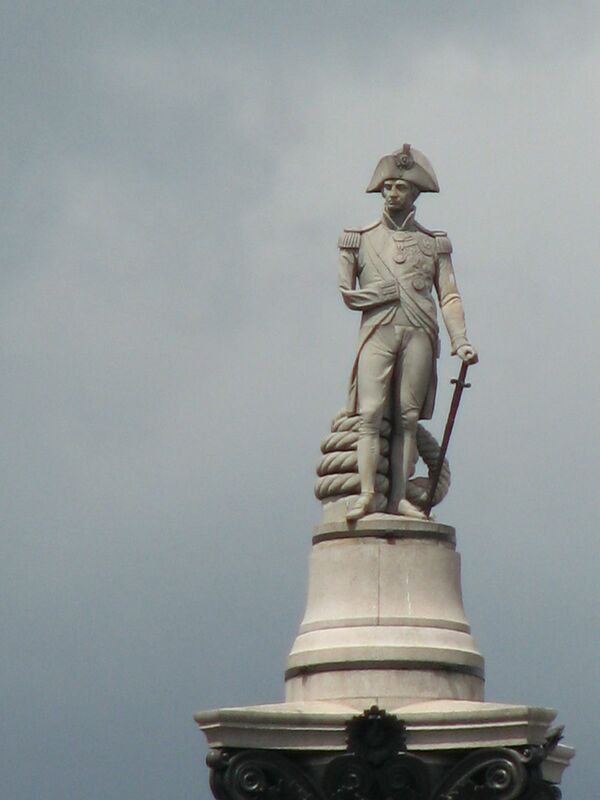 We start at the south end, by Parliament Square, and follow it north to Trafalgar Square. There are fragments left of the old Whitehall palace, here and there within the complex chain of interlocking buildings that lie on the west side of the street Whitehall, but nothing which can be seen from the outside. 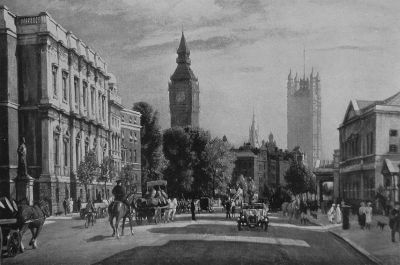 However, starting at the southern end of Whitehall, we have a line of three excellent white Victorian buildings, massive and stately, to recall the spirit of this broad street as it once was. 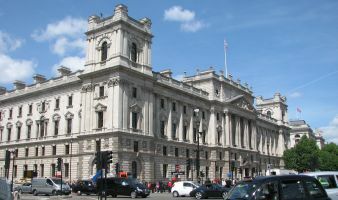 They are the Treasury buildings, the Foreign and Commonwealth Office, and beyond Downing Street, the long flat facade of some of the less showy entities of state - part of the Cabinet Office, odd offices concerned with the legal process and Parliament and so forth. From an architectural point of view, they make a fine sweep for the eye, with something of a skyline, and are the closest we get in London to the planned Government districts of other capitals. The other side of the road at this end is a mix of narrow Victorian blocks, then dissolving to modernity - the set back, quiet Department of Health and the vast MOD building, then the Edwardian Old War Office, a good thing we shall come to, the Banqueting Hall, and back to mixed Victorian frontages. The upper end of Whitehall, towards Trafalgar Square, is blander, almost nondescript, with shop frontages and a former bank, again mostly occupied by odd branches and quangoes of Government. So far as sculpture goes, of our first three white buildings, the Treasury and the Foreign and Commonwealth Office have some, and indeed the latter is the highlight of the whole street. Slighter works are higher up the street and on the right hand side, and in the centre of the traffic and here and there on the right hand side are various monuments to heroes from the past, as we shall see. To view them all to their best advantage, it is necessary to zig zag back and forth from one side of Whitehall to the other. 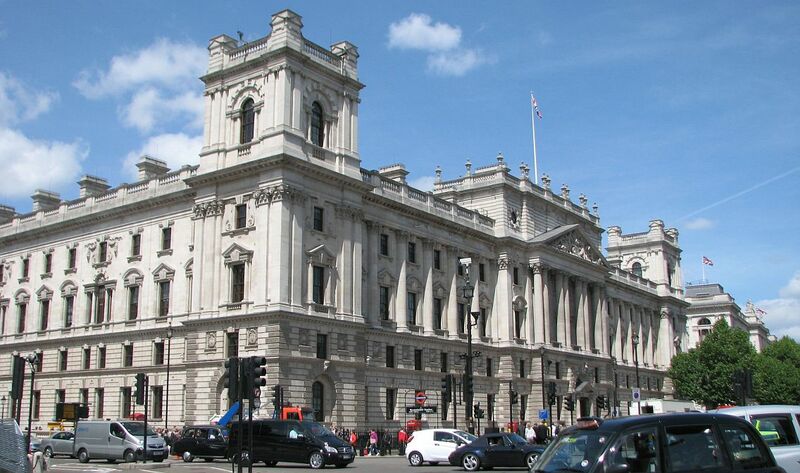 Starting with the Treasury then, which certainly needs to be seen from the opposite (Eastern) side of Whitehall. A substantial building in white stone, a classical edifice with a multiplicity of Corinthian pillars, 19 bays wide and four storeys high, with a square tower at each end an extra storey high, and a massive central portico with an attic storey. The flat roof has a good skyline, with bunched chimneys, and pots around the upper perimeter of the central portico. This high portico has a curiously flat look to it, and to understand this, we need to look at the building from an angle, standing in Parliament Square at the corner of the Houses of Parliament. From there, we can see that the building is double fronted, with an almost equal weight given to the Whitehall and Parliament Square sides. 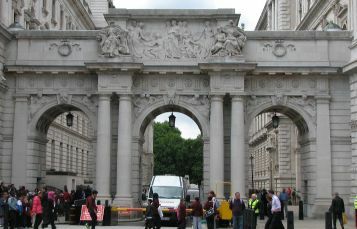 The Whitehall portico, as noted, is the lower part of a gatehouse-type structure that forms the centre part of the facade, and the flatness is to stop the building being unduly weighted on this side. 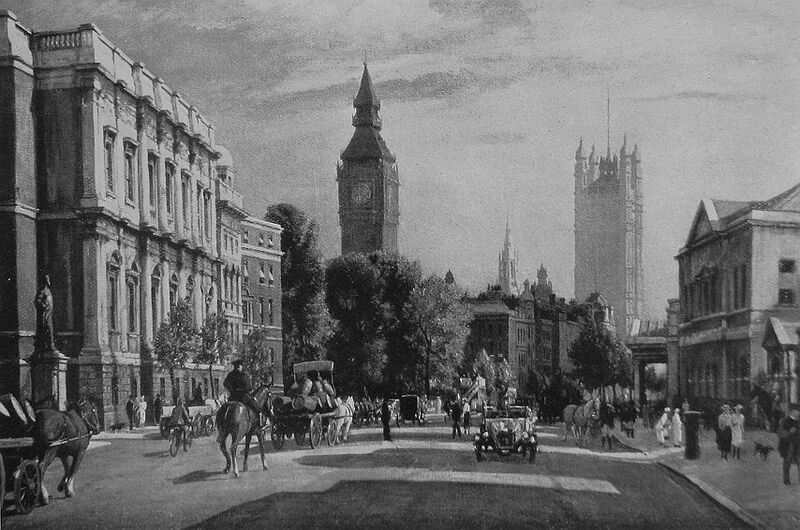 To the southern side to Parliament Square is a pair of centrally placed taller towers, though still squat for their size, with cupolas on top. In fact, the building has three sides to show, as that on the rear, towards St James Park, is also an entrance of importance (the fourth side, towards Great Charles Street, is relatively plain). Pediment of the Treasury building, by Mackennal. Regardless, the lack of prominence of the Whitehall front, this flattened portico, still allows room for a substantial group of sculpture in the pediment which is little noticed by most passers-by. It contains fully a dozen figures, and many accoutrements, and is the work of Bertram Mackennal, and dated 1906. In the centre, we have Britannia , seated cross-legged, unusually, on a short plinth, against which lean a semidraped male and female figure, one to each side. To the left are the arts, reading, navigation and innermost, a sturdy man holding a pot, perhaps emblematic of craft manufactures. To the right we have industrial manufactures - mining, shipping, steel-making, building and trade. Quite a lot packed in to one pediment. The men are heavily muscular, the female figures idealised, but not youthful, with a solidity to the shoulders and upper arms that indicates strength and power rather than youth and grace. 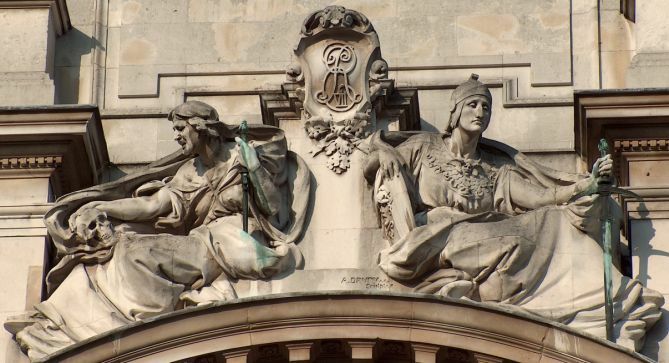 A significant work, Mackennal's only pediment, I think, unless we count the Horses of the Sun on Australia House in the Strand, and the only large pediment sculpture in Whitehall. It deserves to be better known. If you want more pediment sculpture, see this page. Opposite this grand building, among the tall, narrow mix of buildings on the corner of Derby Gate is a pub, the Red Lion, with a heraldic lion in relief at the top, and a floor down, a pair of stone figures in high relief, both turning away from the viewer, perhaps as if inviting the viewer to join them and go in the building. To the left a Satyr-like bearded horned figure, holding a a goblet, with a stylised vine in the background, and to the right a girl with a sickle, and corn behind; these two doubtless indicating the food and wine to be found within. Modest, but I have developed a certain affection for them. In Derby Gate itself, no. 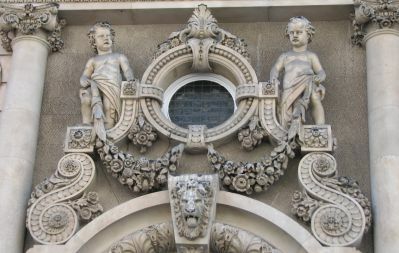 1 has a highly worked door, with the keystone as a snarling lion, and two hefty cherubs in an early 19th Century style above. Each bears a garland of flowers, and other floralities - acanthus, oak and other stylised flowers and leaves - are on the arch, the background and on the adjacent Corinthian pillars. More like a church monument than a door. 1 Derby Gate and a figure from the Red Lion. 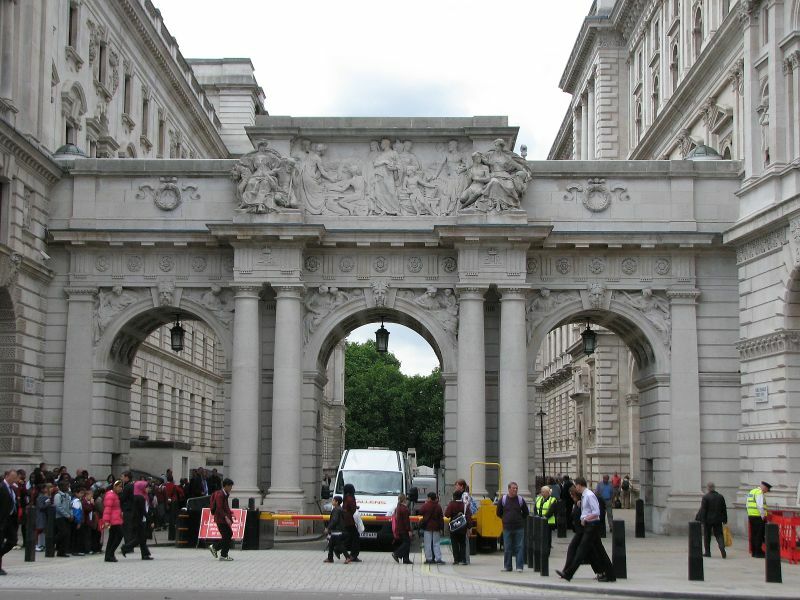 Back on Whitehall, next to Treasury is King Charles Street, with a triumphal arch or connecting Treasury to the Foreign and Commonwealth Office building. This arch contains much sculpture, by two artists. 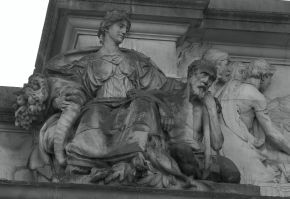 The frieze and two groups are the work of Paul Montford, and are highly characteristic, with square chinned men and heroic women, and groups rather reminiscent of these ones can be seen on Cardiff Town Hall. The leftern group depicts a seated female figure, holding a cornucopia and with her arm on the shoulder of an elderly, tired working man resting on his hammer. A lovely pose to her head, and a sadness to his. The companion group on the right has the female figure with a sword, and her male companion as a youthful sailor . The frieze in between, a curiously busy composition of nine figures in high relief, is a sequence of trade and travel by sea, a nice link between Treasury and Foreign affairs. Underneath, the spandrel figures are by another sculptor, the estimable W. S. Frith. Each spandrel is elegantly occupied by a seated girl and two small infants behind, the one girl holding a globe, the other a scroll - look closely at the infants and background, and there can be seen the symbols of painting, sculpture, chemistry, and a little steam engine emblematic of manufactures. Superior work. (For a discussion of spandrel sculpture, see this page.) 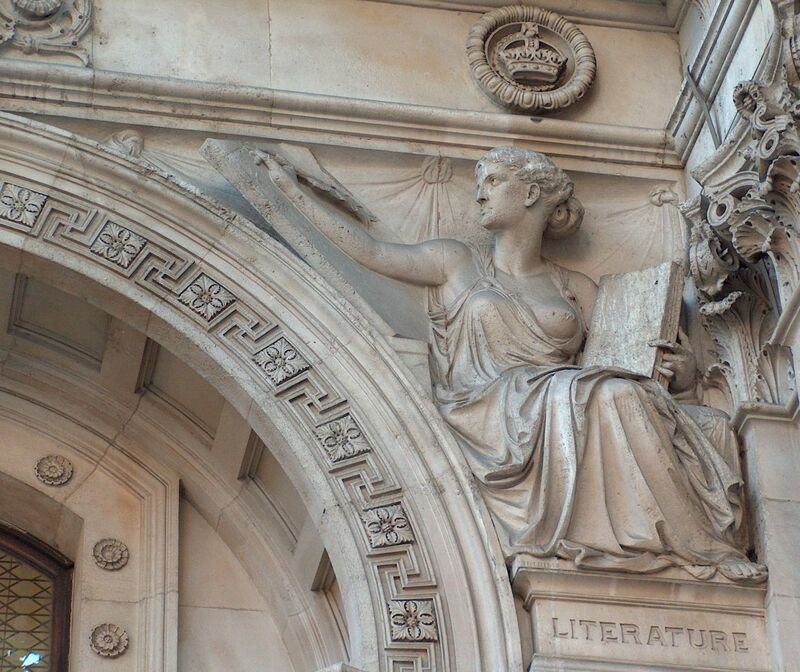 On the rear of the edifice, facing down King Charles Street towards St James's Park, are two further spandrel girls, unaccompanied, one of whom is blind Justice, the other with a book and pen, and some building behind. Superior work. Each side has in addition a bearded keystone head of fierce aspect, presumably again by Frith, and under the arch are nice Italianate rosettes etc. Group by Paul Montford, and spandrel figures by W. S. Frith. Next is the Foreign and Colonial Office, with a large array of sculpture. This is the pre-eminent Victorian building in the street, covered with decoration. It is an Italian Cinquecento design dating from the 1860s, a glorious thing by the architect George Gilbert Scott. The material is Portland stone, with a Victorian polychromatic effect given by various coloured granites, most effectively on the rear of the building facing St James's Park. Top frontage of the Foreign and Commonwealth Office. Regarding the sculptural work, we start from the top and work downwards, describing in some detail. On top of the building is a seated Queen Victoria with two rather small beasts - a lion and a rather worn unicorn (see this page for more on unicorns) - and four flanking classical figures. They are not particularly individualistic, but give a good effect against the sky. Lower down, 8 more modern but semi-classically draped statues in niches, with four more round each corner, fronting Downing Street and King Charles Street. These are not labelled, but the series of little portrait busts in roundels are, and include Cook , Drake , Franklin , Livingstone , Wilberforce and Albert . In central position is the portrait of Edward the Confessor , with above to left and right, full figures in high relief of Christianity (with what seems to be mistletoe behind), and a (male) angel. On the rear of the building, facing St James's Park, another 17 figures, again with some wrapping round the sides. The figures are interesting - some representing modern 19th Century personages, they are in modern dress, but to match the classical and allegorical figures which are intermingled, they have been disguised somewhat with flowing robes - much more than the simple cloaks given to many modern statues. Incongruence is avoided because the 19th Century accoutrements - sleeves, trousers etc - are de-emphasised, so that the classical drapery at first glance looks complete. Next we come to the best ornament of all, the high relief figures gracefully seated in the spandrels (triangular shapes next to arches) in classical drapery. These are by H. H. Armstead and J. Birnie Philip, and are well worth close study. 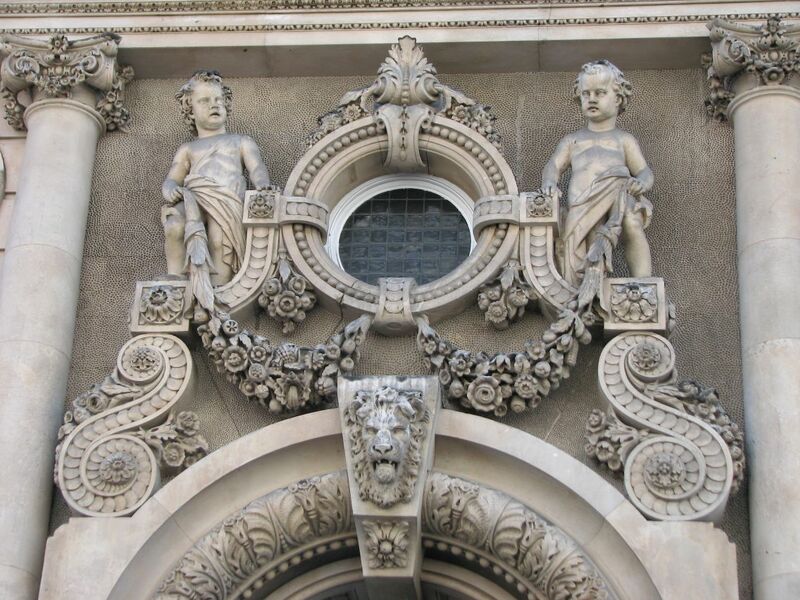 The figures to the right of the main entrance (itself with more figures higher up) belong to Birnie Philip and are allegorical figures of the Continents. We see Australia , with two kangaroos and two sheep, and America in native American head-dress, with a buffalo peering coyly under her outstretched arm. A magnificently wild-looking and buxom Africa , with infant, grinning hippo and exotic palm, matched by Asia , wearing a necklace, armbands and a nose ring, and accompanied by an elephant (shown on this page). Europe of course is more civilised than all these, dressed more modestly than the others, and surrounded by a ship, globe and horse rather than any more savage animal. 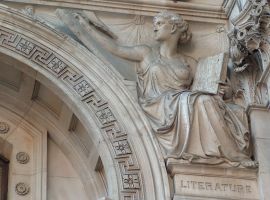 This series is flanked by two male figures - Education on the right, and Government on the left, towards the centre of the building (more Education statues are on this page). To the left is the work of Armstead, a series of rather more heavily draped females, the principle ones accompanied by angels. America and Literature from the front of the Foreign and Colonial Office. The flanking figures are Law and Literature , each with tablet and pen. Agriculture is particularly sympathetic, with sheep (which raises our count to three) and corn. A careful look at Art shows the expected accoutrements, and Science may be seen to include astrology. The series is completed with Manufacture and Commerce , the latter of which rests her arm on a plinth depicting a camel, which will satisfy those missing the beast in the Africa figure on the other wing. 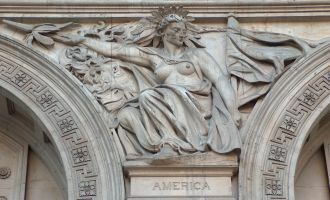 We mentioned the pair of figures high up on the central portico - to the right, again by Armstead (signed), is a fierce Britannia wielding a spear - her own almost Norman shield is studded with three spear-heads of some unseen enemy; to the left, a seriously Valkyrie-like handmaiden with mirror - look at those shoulders. Excellent and wholly satisfying work throughout. In the centre of the road, the Cenotaph, by Lutyens, without sculptural decoration bar two wreaths, dates from 1919-20. Proceeding, in front of the MOD are three bronze statues, too modern for us, of Monty , Allanbrooke and Slim . And in the centre of the road, from 2005, is the monument to the Women of WW2, by John W Mills. It shows a variety of hanging female uniforms, and one cannot suppress a little inner twinge of regret on thinking of what one of our Victorians or Edwardians would have made by way of allegorical sculpture for a title like that. 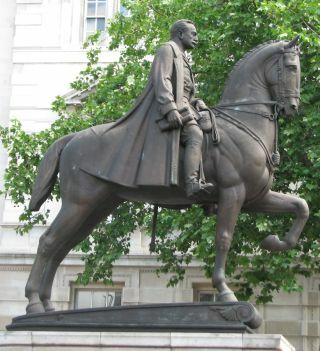 Moving on, another centrally placed monument, by the entrance to the Scotland Office, is Earl Haig , ahorse. An excellent bronze, best seen exactly in profile to appreciate the stylised prancing effect of the horse, it dates from 1936. The sculptor was Alfred Hardiman, not so well known, but notable as being responsible for the very stylised lions in front of Norwich Town Hall. Almost opposite is the famous Banqueting House, early 17th Century by Inigo Jones, and visitable with a ceiling by Rubens. Outside above the door is a discrete bust of Charles I by Hubert le Sueur, after the statue of him in Trafalgar Square, and commemorating his being taken from here to execution. 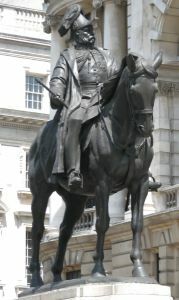 Opposite Horseguards, central to the entrance of Horseguards Avenue, is a standing bronze figure of Spencer Compton, Eighth Duke of Devonshire , on a high pedestal. The date is 1910, and the sculptor was Herbert Hampton, really rather obscure, and his only other public statue that leaps to my mind is Lord Aberdare in Cardiff. Unobjectionable, but better go to Eastbourne to see Alfred Drury's superior version of Spencer Compton. A small diversion down Horseguards Avenue is worthwhile to see the monumental stone figures of Earth and Water , flanking and above the two story portico of the Ministry of Defence, by Charles Wheeler, highly successful. And on the corner beyond, left, is a staue of a Gurkha soldier , by Philip Jackson, after a work in India by Richard Goulden dating from 1924. Next, the final of the more remarkable buildings on Whitehall, the Old War Office, a large baroque building in white Portland Stone by the architect W. Young, fronting on to Whitehall, Whitehall Place and Horseguards Avenue, with good preserved features inside. High up - too high up to see from a good angle - are groups of stone sculpture by the aforementioned Alfred Drury. These monumental groups, each containing a pair of reclining female figures, are highly allegorical. They represent Peace ( Sorrow and Joy ) and War ( Horror and Dignity of War ) on the Whitehall side; Truth and Justice on the Whitehall Place side; and Victory and Fame overlooking Horseguards Avenue. Each group is duplicated on opposing corners. These statues have much to recommend them, especially in the way they complement the architecture and give a feeling of massiveness and solidity surpassing even their large size. The Old War Office, and one of Drury's groups. George, Duke of Cambridge, by Adrian Jones. In front of the Old War Office we have another equestrian statue, of George, Duke of Cambridge , wearing the flamboyant hat of a field marshall. 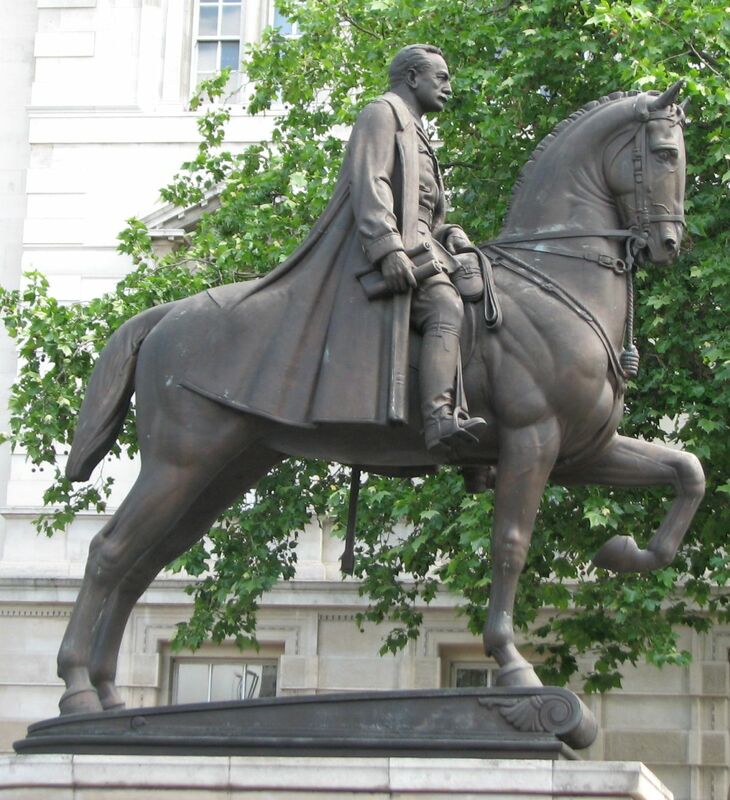 It is the work of the equestrian sculptor Adrian Jones, and a good thing. Immediately beyond the Old War Office, the road to the right is Whitehall Place, where we can see a second, relatively small pair of stone groups above the door to what is now the Energy and Climate Change Department. Perhaps again the work of Wheeler. On the left hand side of Whitehall, we next have the screen to no. 26, the old Admiralty building, with the screen in front by Robert Adam, with charming little hippogryphs atop, and little relief sculptures showing dolphins and an old and more modern battleship (there is a whole page on this site on ship sculpture). 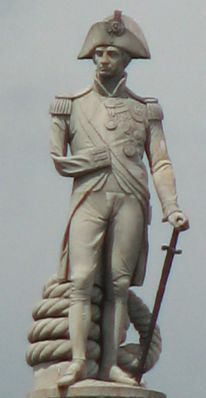 The screen dates from the 1780s, the building behind from the 1720s, and it retains a suite of decorated state rooms with pictures etc, as well as a working model of Nelson for the column. And after this, we pass the former Glyn's bank, now part of Cabinet Office, to arrive at Trafalgar Square, to greet Baily's Nelson , whom we could see from half way along Whitehall.